The softness of this Lavender Rose Archival Digital Fine Art reflects a calm, cozy feeling floating on cream linen blending so perfectly framed with an iridescent wooden frame silver edge. This “Lavender Rose” Archival Re-creation has a deckled or hand torn edges as it rests against the linen background. Hand painted with layers of pastel “Lavender Rose” creates the feeling of the velvet texture of a Rose with its flowing soft curves and light freshness. 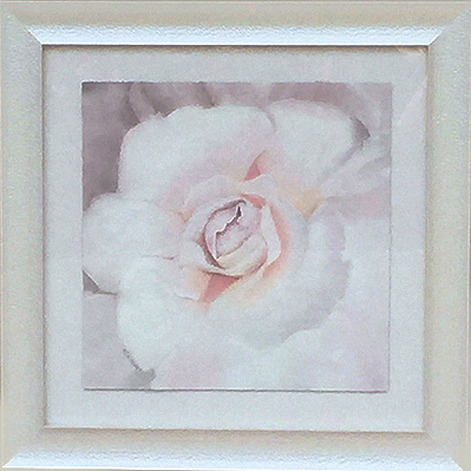 Surrounding the rose with the texture of the linen and the frame widens the beautiful presentation. I feel so lucky to have the opportunity to create these hand painted Archival Digital Fine Art reflecting my original paintings with such accuracy. Hand painting is in itself an art. Using the same pastel color layered on the original the outcome is outstanding. The light soft, airy feeling brings calming, loving emotions to the place you love. Lavender Rose is a Unique One of a Kind work of art. Creating these wonderful pieces is very special since choosing these special combinations are found by searching frames like this one. There are actually two frames surrounding Lavender Rose. The iridescent frame with its semi gloss shine against the silver border frame surrounding the art. This is a one of a kind work of art. There is only one.